There’s nothing like a journey through history to give you a fresh perspective on the here and now. If you’re looking to gain a greater understanding of this important region, here’s an itinerary that will help you to make huge inroads. 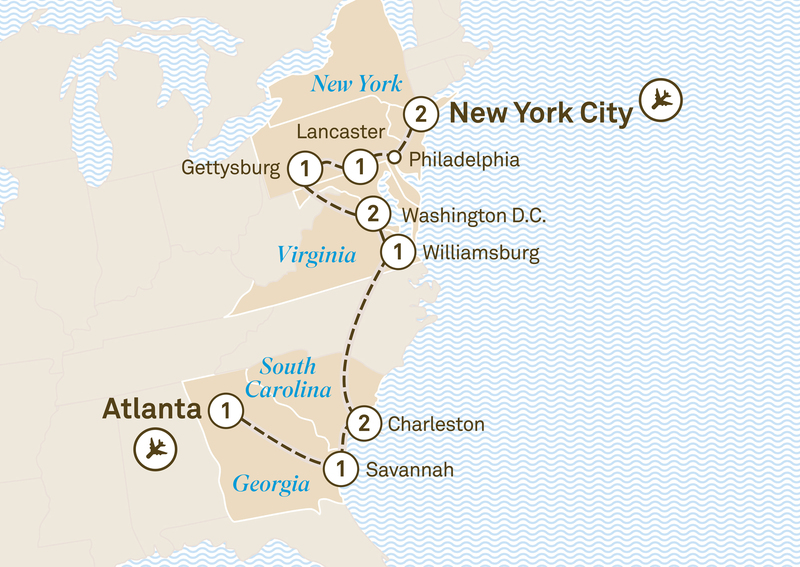 From exciting New York to Atlanta, this itinerary has been devised for those with an abiding interest in America’s East Coast, both North and South. From Philadelphia, where the nation’s Founding Fathers first gathered, to Gettysburg, the scene of one of the great turning points in the American Civil War, you’ll be spirited through some of the most historical points on the North American map. Washington D.C., Charleston and Savannah – enjoy stops at great cities and towns that exemplify key moments in the American story, from its early colonial history, to struggles for freedom and independence. It’s time to say goodbye after a wonder-filled journey and transfer to the airport for your onward flight.